Malcolm Boyd was as American priest, civil rights and antiwar activist, and author of more than 20 books. He is also gay and has been with his partner, fellow writer, editor and activist Mark Thompson for about 30 years. It is an interesting combination and its not surprising that Boyd has the Sun in Gemini, a sign whose motto is never be content to be just one thing in life. The real joy is in tasting lots of different experience to compare and contrast them. Boyd’s Sun is in the 9th house, the place of higher education, religion, philosophy and understanding. People with the Sun in the 9th would be engaged in a search for meaning, and in Gemini would look for it in lots of different places. The fact that the Sun is in close square to Uranus means that Boyd’s search would take him in lots of rebellious and unconventional directions. In the 1940s Boyd moved to California and became a Hollywood junior producer, founding PRB, a production company, with Mary Pickford. At the same time, amidst all the abundance, he found himself looking for meaning in churches. As a result he became a priest in the Episcopal church. His approach to religion was open minded and his aim was to share the message with everyone, regardless of their background or appearance. He was dubbed the “espresso priest” for his talks given in coffee houses and bars, a perfect moniker for the Sun in Gemini in the 9th as this sign is always on the go, moving quickly from one experience to another. Most appropriately his best selling book and the thing that most identifies him was entitled ” Are You Running with Me, Jesus?”, another delightful expression of the Gemini / 9th theme. The book was published in 1965 as Pluto was square his Gemini Sun at the time. Boyd became a prominent white clergyman in the American Civil Rights Movement. He participated as one of the Freedom riders in 1961, who rode interstate buses into the segregated southern United States to challenge the non-enforcement of the Supreme Court decisions which ruled that segregated public buses were unconstitutional. He was also active in the anti-Vietnam War movement, marching with Martin Luther King, Jr. in 1968. The Sun’s square aspect to Uranus was evident in both cases. When Pluto was opposite his Moon in Aries in the 7th and conjunct his Saturn in 1977 Boyd, who is gay, came out. This is such a perfect transit to emerge from the closet as the 7th house rules relationships and the Moon in Aries is all about asserting oneself strongly on issues of feeling and personal contacts. The conjunction with Saturn neatly describes the powerful opposition that came his way from the church authorities and congregations in general. It was almost unheard of to be a gay priest at this time. Capricorn Research has a collection of 1787 Gay Men and the conjunctions between both Mars and Venus ( the planets that rule sexual expression ) and Saturn score very highly. Most of the members of this sample lived through a period of time where there was very strong opposition to homosexuality and these aspects show a shared experience of how restrictive that was. Boyd’s Moon in Aries in the 7th opposite Saturn shows his defiant and assertive stand against all the conservative opposition. From this point onwards he devoted much of his life to gay and lesbian issues. 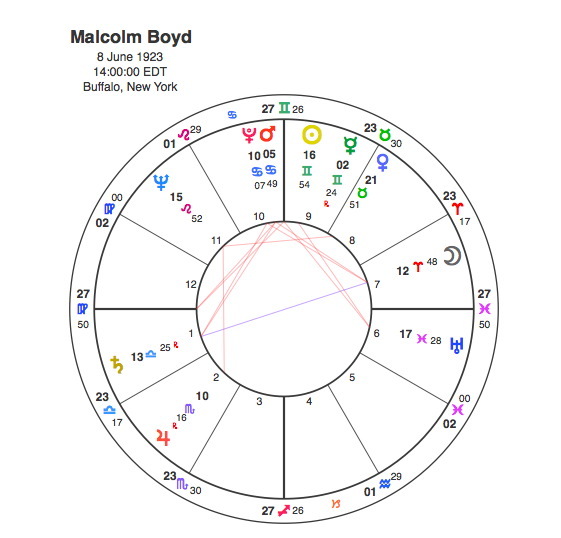 Boyd’s Moon / Saturn opposition focuses by T Square onto a Mars / Pluto conjunction in the 10th house, showing the tensions and challenges that forced him to make deep and profound changes in his career. With this conjunction at the apex of a T Square he became someone who enabled many people to make powerful change within themselves.